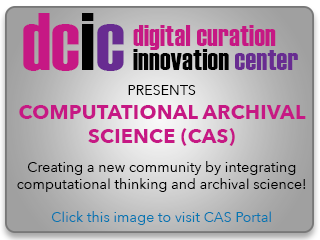 The Digital Curation Innovation Center (DCIC) is happy to announce we will continue to engage in a number of interdisciplinary research themes/projects for this spring semester. If you are interested in gaining new digital skills, conducting interdisciplinary research, and exploring professional development opportunities at the intersection of archives, big data, and analytics, feel free to join one of our ongoing projects. Project teams are typically made up of iSchool students (MLIS, MIM, HCIM, Doctoral & InfoSci), faculty, staff, and community members outside the iSchool. Please e-mail dcic@umd.edu with the projects you are most interested in, the week after the Open House (1st week of February). No prerequisites needed, just the desire to develop new skills and play, however, students should expect to dedicate at least 2 – 3 hours to the project per week.